In an ever growing economy like Singapore, people’s lives gets busier to cope with the rising cost of living. As such, it is not uncommon to have both parents enter working society to earn an income. Thus, more time outside means less time at home, the need of full time stay- in helpers to handle household chores and taking care of the child/elderlies has become a staple in many families. With a rough gage of 250,000 domestic helpers in recent years, Indonesian maids makes up nearly 50% of the numbers and is still on the rise. Now the reasons why Indonesian maids are popular is largely due to most of them are affordable, well-behaved, hardworking and good with household chores. Most of them also share similar religious beliefs, practises and dietary preference as Muslim families, however this factor can be a double edge sword because they may have difficulty integrating to families of different religion which consumes pork but nearly 90 % of Indonesian maids have no issue with it. They prepare meals containing pork but does not consume it. However, most Indonesian maids are often perceived to be forgetful & clumsy and most of them also lack the familiarity of city living. Despite that, they remain a popular choice among employers as most of them are obedient, dedicated to the job and coupled with a willingness to be trained. Which is why most employers with Indonesian maids tend to be satisfied with the maid. 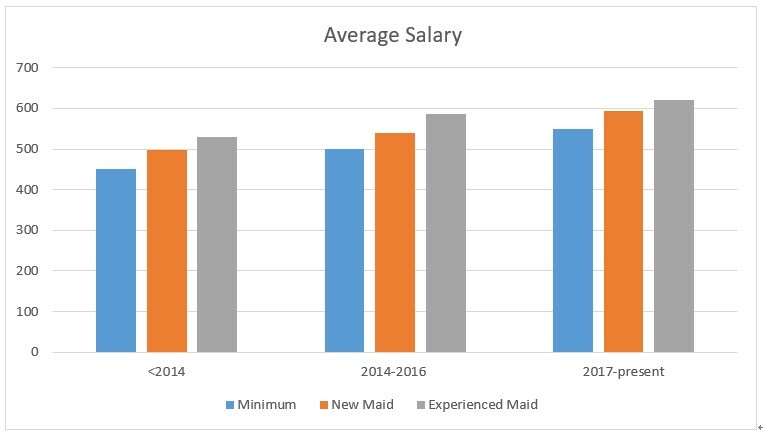 With the ever increasing demand for Indonesian maids also comes with increasing salary. The minimum salary imposed by the Indonesian Embassy’s Overseas Labour Office of $550 in 2017 which was a revise of $500 in 2016 and $450 before 2014. As such, most Indonesian maids command a higher salary as compared to other groups except Filipino maids which have a higher based minimum salary of $570. Since April 2018, employers hiring a new Indonesian maid have been asked to purchase a performance bond guarantee from one of two insurers approved by the embassy, which requires a one-off $70 payment. They also have to sign a standard employment contract. Employers will have to pay the full $6,000 only if they breach the terms of the employment contract issued by the embassy. How to Hire an Indonesian maid? There are various ways to hire a maid such as through Direct Hire, Maid Agency and by online platforms such as SearchMaid. If employer knows the maid personally, communication will not be much of an issue, working together will be much easier and pleasant. Maids are not burden with huge loans from maid agencies. Many paperwork to file (KTKLN ID Card) furthermore, process can be long and strenuous especially if the maid is brand new. Approval from the Indonesian embassy is required, long waiting time thus, employers in urgent need of maid usually go through maid agencies. Brand new maids may have a language barrier with the employer, unlike those that went through agencies as Basic English is taught, miscommunication and mistakes are bound to happen. Filing and filling up forms and paper work is mainly done by agencies. The slow and troublesome process is much faster. Some agencies provided transfer maid which suits employers that urgently need a maid. Provides basic training for new maids, such training may include, introduction to Singapore, commonly used household equipment and some Basic English. Employers will have a much easier time with a semi-trained maid. Each agency can only have so much maid, some agency may not have as many maids. Hence, for employers with specific requirements, finding an ideal may not be as easy after all. While finding a maid agency, employers may come across different variation of cost, some ranging from hundreds of dollars to some thousands of dollars. It would be tricky for employers to differentiate a reliable agency from the rest. Large database of 8000+ maids, more efficient in finding potential maids from 170 over registered agencies that matches with employer’s requirements (such as maid’s religion, marital status, education level, spoken languages and specific skills possessed). Now how to choose a good maid agency? Here are some useful pointers to take note when you find a maid agency. Maid Agency must be approved and licensed by the Ministry of Manpower. Note that only licensed agencies can help you hire a maid as the procedure must be fit MOM‘s Rules and Regulation for hiring Foreign Domestic Worker. Information such as demerit points for each individual agency can be found on MOM’s website, avoid agencies with high demerit points or is under MOM’s surveillance. Likely these agencies have violated MOM’s rules and regulation thus, strong discourage employers to engage service with these agencies. Reviews of agency from online platforms such as social media, forums and blogs is also a good reference to different a good maid agency from the rest. Retention rate on MOM’s website is another tool for evaluation also, they measure the percentage of maid in each agency that have stayed with the same employer for at least a year. A high retention rate is more desirable. Placement Rate, high placement rate is considered more desirable as this shows how effective the agency is at delivering maid to the employers. The employment agency will require that you sign a service agreement before you can use their services. The service agreement will be the basis of the transactions made with the agency. Expenditure of each cost must be clearly stated. Terms used must be simple and easy for employers to understand. This ensure that employers are aware what they are spending on. Refund policy must be clearly indicated. Stating clearly which fees is refundable and which fees are not. This ensures fairness between the employer and agency thus prevent any dispute or argument if something goes wrong. Replacement policy must be clearly indicated, this ensures that employers can get a replacement maid in a scenario which is required. Lastly, different agencies have different ways of management and operation, it is advisable for employers to clarity any doubts or questions with the agency first before agreeing to engage in their services. *Fees stated above is only a general guideline. Actual total fees varies with different Agencies. In the market, agency fee varies with different agency, for agencies that charges way below average, employers need to be aware of what type of service coverage do these agencies provide. And for agencies that charges too high, it doesn’t necessary mean that it is good also. It is advisable for employers to do a rough background check of the agency first before engaging in service. For Medical check-up fees, it also varies with different clinics however the difference between each clinics is minimal. *Fees stated above is only a guideline. Cost such as wages, transportation, food and toiletries varies with different households according to the maid’s main job scope. If she's new to Singapore, having some knowledge of the maid’s situation at home can help employer to better understand the maid, thus employers know what to take note of so that the maid’s work is not compromised. *TIP: Ask important questions regarding the maid’s family, expectations and concerns. If the maid is new, she might be unfamiliar with how to operate machines such as vacuum, washing machine or electric stove. Employer have to step in to educate the maid on how to use them and make sure that she is doing it correctly so that her safety is not compromised. Furthermore, new maids that are not fluent in English may sometimes find it difficult to understand what their employers expect of them thus, employers should do the courtesy of giving the maid some time to understand and use short & simple words so that the maid can better digest the instructions given. For experienced/transfer maids, most should not have an issue with chores but, reframe maids from doing dangerous chores such as; external windows cleaning, climbing to high heights. 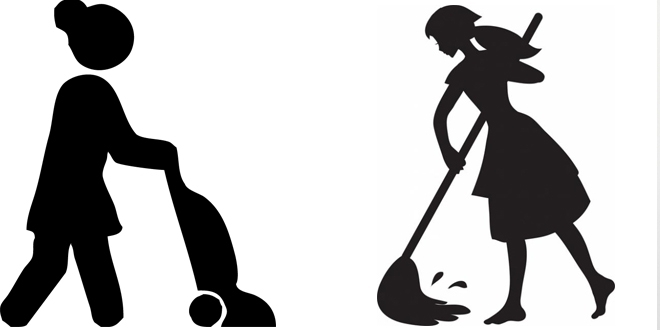 No matter how experienced the maid is, accidents do happen and employers/ another adult must be present to inspect the maid if she is doing chores that may compromise her safety. *TIP: check on the maid when she is doing chores that requires climbing to heights or expose herself to potential danger. Maids are humans too, humans have emotions, fears and concerns. 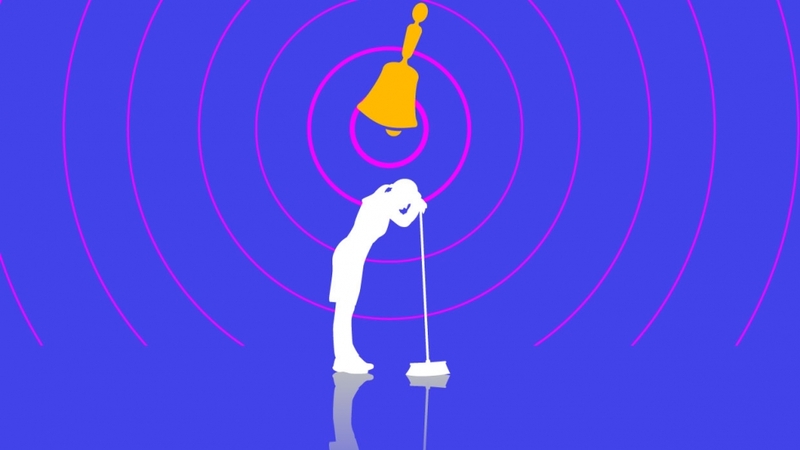 Employers should encourage maids to voice out their concerns and strive to resolve them. This will make the maid feel appreciated and comfortable in her working environment, you be sure that the maid will put in the best efforts in her work. *TIP: Talk to the maid more often and ask of her well-being from time to time, ensure that she is comfortable in her working environment. 1. Weekly off day, 1 day salary or replacement rest day as compensation if she is required to work on her rest day. 2. Mutual agreement between worker and helper on which day of the week is her rest day. 1. Maids should be accommodated with adequate shelter that protects her from rain/sun/strong winds. Such shelter should also have basic amenities such as mattress/blanket/toiletries. 2. Maids’ accommodation should provide sufficient privacy, space and security. 3. Minimal of 3 meals per day must be provided for the Maid.